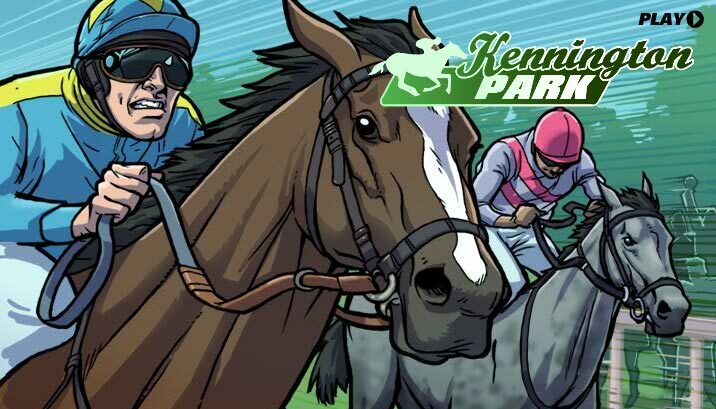 Kennington Park is an on demand race meeting that brings all the thrill and excitement of spread betting on horse racing direct to your desktop. This unique six race meeting offers a variety of exciting bets on both individual races and the meeting as a whole. Choose from a range of markets such as individual horse performance, winning distances or starting prices, place your bet then sit back and watch to action unfold. The runners and riders are making their way down to the start, so study the form, choose your bets, then sit back and watch the action unfold and dont forget, you can back a horse to do well or do badly, its up to you! When the game first loads you'll be given the option of choosing between either 'Race Bets' or 'Meeting Bets'. Here's what's on offer starting with individual race bets. This bet is a prediction on the racecard number of the first two horses past the post multiplied together. Example: In Race 2, the 'Horse Crazy' price is quoted at 50-53. If you thought the lower numbers would run well, you might bet 'Low' at 50 for 50p. If horse number 2 comes 1st and horse number 7 finishes 2nd then the result will be 14 (2 x 7). Therefore, after going 'Low' at 50 for 50p, your profit would be £18. Calculation: (50-14 = 36) x £0.50 = £18. However, if horse number 6 comes 1st, and horse number 10 comes 2nd, the result will be 60 (6 x 10). Therefore, after going 'Low' at 50 for 50p, your loss would be £5. Calculation: (50 - 60 = -10) x £0.50 = - £5. This bet is a prediction on the starting price of the winning horse. For the purpose of this bet, a 3-1 winner is counted as 3 points, a 4-1 winner as 4 points and so on. Where the starting price is not a whole number, the price will be rounded to the nearest decimal place. For example 9-4, which is 2.25-1, is counted as 2.3. Example: In Race 1, the Winning SP price is quoted at 9.8-10.2. If you fancied a long priced horse to come in, you might bet 'High' at 10.2 for 50p. If the winner of the race was Ducat Raven with an SP of 20-1, the result would be 20. Therefore, after going 'High' at 10.2, your profit would be £4.40. Calculation: (20 - 10.2 = 9.8) x £0.50 = £4.40. However, if Wisecracker had won the race with an SP of 5-1, the result would be 5. Therefore, after going 'High' at 10.2, your loss would be £2.60. Calculation: (5 - 10.2 = -5.2) x £0.50 = -£2.60. The 'Form' figure to the left of each horses name represents the number of times that a particular horse has won in the previous 100 running’s of the race. The figures are not based on races run solely by you but on all races run by all clients, and are updated at the end of each completed race. Each of the bets you see relates to the results of every race in the six race meeting. This means that you can place bets at the start of the meeting then take a profit or cut your losses at any time between the six races. You will have three minutes between each race to review your bets and place any new ones. After this time, the race will start automatically. If for any reason you wish to skip to the end of the meeting without watching any more races, click 'Finish Meeting'. You will then be shown the final meeting results without any of the remaining races being shown. The total here is 42, double this (hence 'Double Numbers') and you have a final result of 84. How will the favourites perform in each race at Kennington Park? A favourite is awarded 25 points for winning, 10 points for finishing second, 5 points for third and 0 points for any other place. See who the favourite is in each race by checking the racecard. Example: The price for favourites at Kennington Park might be 54 - 56 points. If two of the favourites win, two finish second, one ran on into third and the other finished out of the first three then, on the basis of our scoring system, the result would be 75. This is the total starting prices of all the winners at Kennington Park. For this bet a 5-1 one winner is 5 points, 10-1 is 10 points, 5-2 is 2.5 points etc. The total result would be 41.5pts. Example: The total winning distances at Kennington Park might be 6.3 - 6.6 lengths. If two of the races were won by a head (0.4), two by half a length, one by 2 lengths and one by 4 lengths then the final result would be 7.4 lengths. This is a market on the performance of the horses named first in each race (number 1). The ‘Heavyweight' in each race is awarded 25 points for winning, 10 points for coming second, 5 points for third and 0 points for any other place. Example: The Heavyweights prediction for the six races at Kennington Park might be 35 - 37 lengths. If Heavyweights won the first and second races (50pts) while two others came second in two other races (20pts) with all the Heavyweights unplaced, on the basis of our scoring system, the result would be 70 points. A prediction on the racecard number of the winning horse multiplied by the racecard number of the second horse. Like all other meeting bets, these are then aggregated together for the six races. Example: Our Kennington Park Multi-Mules price for all six races might be 198 - 208. If the results had been as above, then the final total would be 188 points. Although the names look like horses they're not, they're the owners! For Kennington Park we will make a price on how these owners' horses will run. This is similar to the Favourites and Heavyweights markets with 25 points awarded for a winner, 10 points for second, 5 points for third and 0 points for any other place. Each owner's horse is denoted by the colour of their silks: green for Lady Luck, turquoise for Sir Loin, pink for Lord Toucan and orange for Sheik McToom. They each have one runner per race so worth checking the price of the horses before you bet! Example: Sheik Laden's price for his six runners may be 38-40. If the results had been as above then the final total would be 55 points. You are now leaving the game. The game will continue to play behind the scenes and any bets you have placed will still stand.